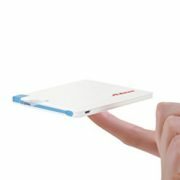 Portable, small, lightweight, yet powerful charging device that is compatible with all smartphones. 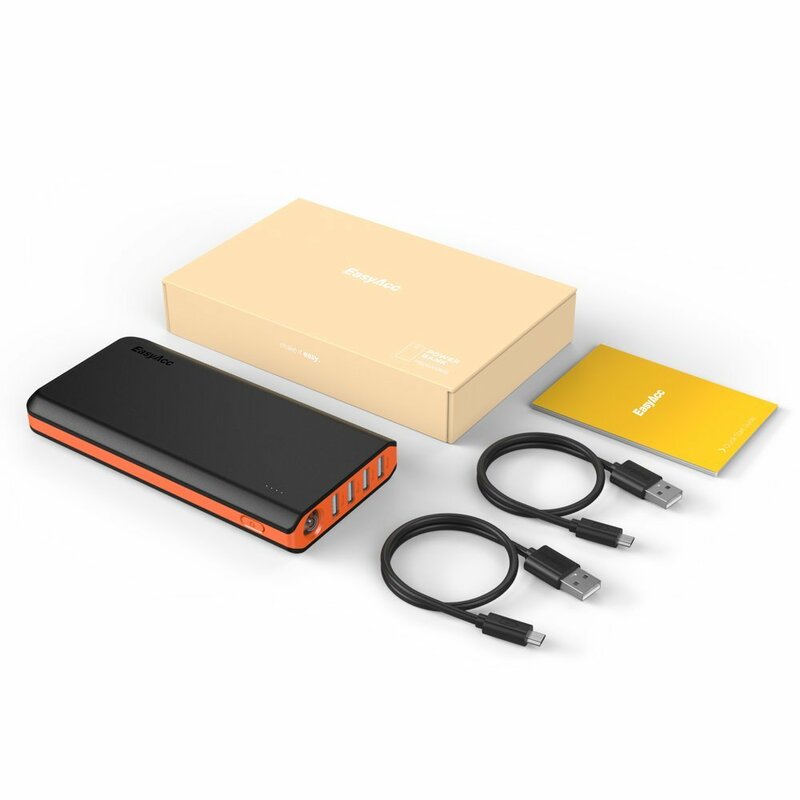 Charge an iPhone 6 over five times, a Galaxy S6 four times or an iPad Air more than once. Doesn’t get hot while charging, and always reliable. Built really well and the price was great! 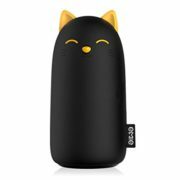 This external battery has a lot of power! I was able to charge my iPhone 6 5 times before it died. There are no rubber feet on the bottom so the unit can slide. It works as advertised, but the time to recharge it is ridiculous. Perhaps that’s normal given the mAh, but it’s a good part of a day to get it back full. 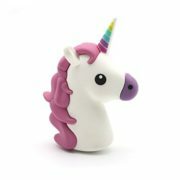 Only con, it is not a fast charge powerbank. 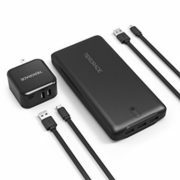 You probably own several mobile devices (phones, tablets, bluetooth headsets, speakers, etc), and have encountered situations where you need power on the road when you’re not near a wall charger. 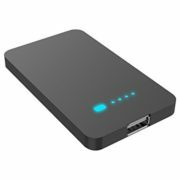 There are a number of choices for mobile battery packs to serve that purpose. 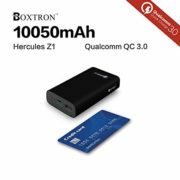 There are inexpensive knockoff brands on Amazon for $10+ , as well as expensive brands at your electronic stores that are $90+. 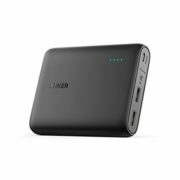 Anker is a brand in case you’re not familiar with them, that is absolutely superb in terms of product quality and customer support. 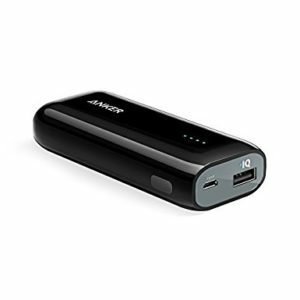 I purchased this Anker PowerCore 15600 mAh battery from Amazon for $30 and really love this battery. 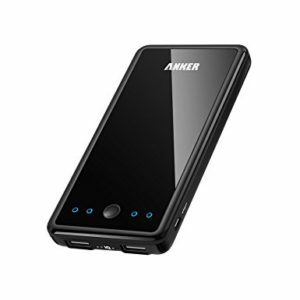 I have a number of batteries from other brands and a previous generation Anker Astro E4 in the past and this beats all of them in every way. The box comes with primarily the battery itself, a mesh pouch, and some manual instructions. Picture of everything is attached below. 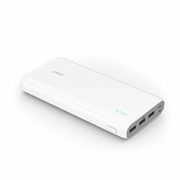 The biggest improvement is the 4.8 Amps total across both ports so you can charge 2 demanding 2.1/2.4 Amp devices currently at full speed. 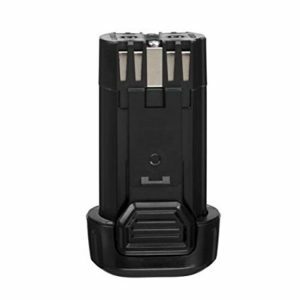 Slightly older generation batteries from other brands or the E4/E5/E7 series only supported up to 3A. With today’s high demand devices, you need the 4.8A, as most devices are 2+ Amps. 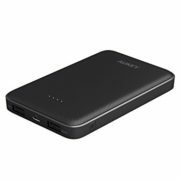 The battery is rated at 15600 mAh, in my real testing I get about 12600 mAh actual which is an impressive 81% efficiency rate! The devices I used it to charge were Note 4 (3220 mAh), Galaxy Tab Pro 8 (4800 mAh), Galaxy Tab S (7900 mAh), Nook HD+ (6000 mAh), iPhone 5 (1440 mAh). 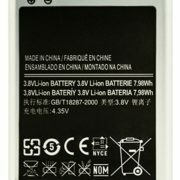 From my experience, an 81% efficiency is extremely good for these types of external batteries. I’ve tried other brands and they don’t get anywhere close to that. My E4 could only dish out 8500 mAh although it was rated at 13000, so that’s only 65% efficiency. Same with other brands as well, I’ve typically seen 60 something percent efficiency. With this battery, I can get almost 5 charges on my Note 4 which would last a whole week (I start charging at around 25% battery left). As I noted above, it can charge my Barnes & Noble Nook HD+ also so that is a big plus. 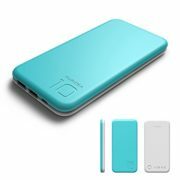 The Nook HD+ is very particular with the 5.1 volt charger it requires so this is great that it is supported for those who either use the B&N interface, or have put CyanogenMod on it. 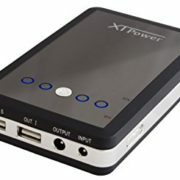 This PowerCore also does not get hot when charging 1 or 2 devices. 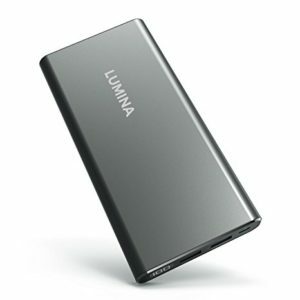 With other brands and also the the E4, they did get hot when charging 2 devices concurrently. This might not be a big deal but I do like the dim led indicators. Other batteries have bright leds to indicate how much battery is left but this one is real dim, almost can’t even see them. Hey, if it saves battery to charge my phone, I’m all for it. 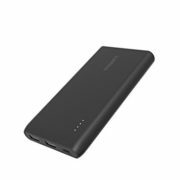 This new PowerCore series has changed the finishing on the battery where it’s now a matte casing instead of glossy from the previous generation. The matte finish helps to prevent fingerprint marks that were frequently seen on the E4 series. This new PowerCore series also took away the flashlight that was present in the E4, but that was a feature I rarely used on the E4. It was a little longer than the E4 but since then I’ve been used to it, it’s not a big deal anymore. I don’t have the E5 so maybe the length is similar to the E5. 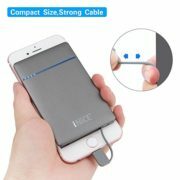 It’s a little too long to fit in your pocket, but it can easily fit into my work laptop bag, womens’ purses, and it’s easy to carry around to use at home on the couch so no need to be by a wall charger. Just an awesome purchase, money well spent, and I recommend to anyone. 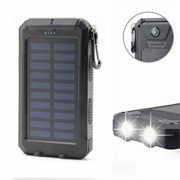 Don’t purchase any cheaper knockoff brands, there are tons of them and I can tell you from experience they are very poor in quality (slow charging, sometimes don’t work, make high pitch sounds, etc). I’ve purchased and returned them to Amazon or they are just lying around the house unused. 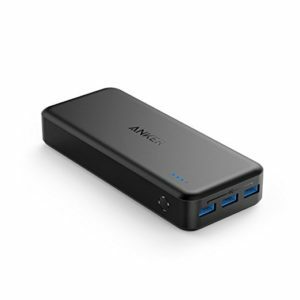 This Anker PowerCore 15600 doesn’t have any of those problems, it simply just works great. 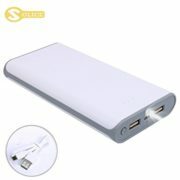 The only drawback is the long charging time of the battery itself. It took me 9 hours to fully charge the battery using a 2.1 Amp wall charger. A Qualcomm rapid charger feature would be a nice feature to add. Durable, long lasting, and fast. I can charge this up overnight and not have to worry about power on the go all week. 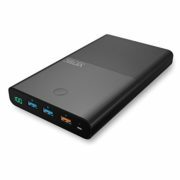 Additionally, because of its quickcharge, I can not only support my phone while playing Pokemon Go, but actually charge it at a reasonable pace while playing. 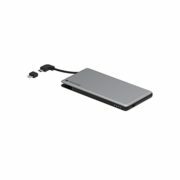 Other power banks basically only kept me afloat, charging only a percent or so every thirty minutes, or even just slowed the drain, rather than stopping it. I’ve dropped it a few times on concrete by accident from a normal height (between 3 and 5 feet) without it breaking, as well, so it’s fairly durable too.